The Head of the UGCC: "From a wrongdoer one can become a law-abiding citizen"
It's important to help imprisoned people not only in jail but also help them reintegrate, return to the free world. 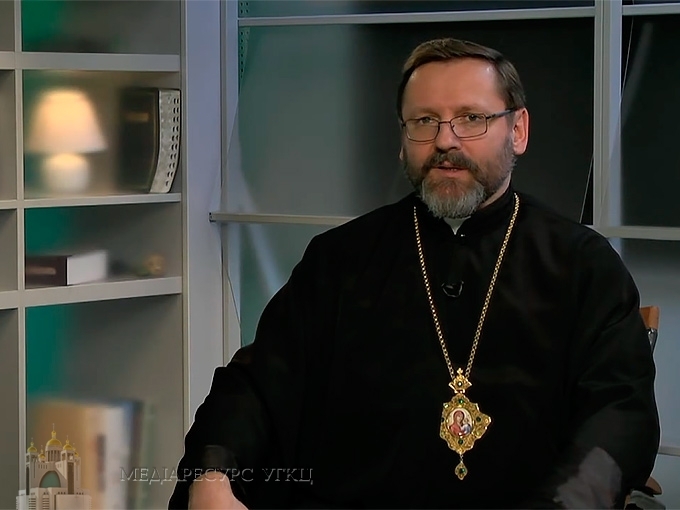 This was said by the Father and Head of the UGCC His Beatitude Sviatoslav during the live TV program "Open Church", devoted to prison chaplaincy. "All of us must believe - both the society and the imprisoned, that it is possible to change one's life, that a person who is put behind bars, isn't always a criminal. It's not a stigma which must accompany a person all his life. From a wrongdoer one can become a good citizen, and we have to make every effort for this: both the imprisoned and the society, and, in particular, Church as a kind mother. The hand of Church, the hand of a chaplain - is the hand of God, which under any circumstances is stretched towards each of us," pointed out His Beatitude Sviatoslav, commenting on the story in the program about conversion of a former prisoner, who is now working with people in the parish. He noted that at the moment the UGCC has 33 prison chaplains. "A chaplain with his presence brings God's light into this unfair, cruel, and often inhuman situation, where prevail predatory laws of criminal world. And those thirsty souls are so attracted to it and need it indeed," observed the Head of the UGCC. Speaking of the service of prison chaplains, His Beatitude Sviatoslav remarked that a priest shouldn't be interested in what a person got into jail for, so he cannot judge him. "The first commandment of a prison chaplain - not to judge a prisoner. Another commandment or task - to know how to listen", he observed. His Beatitude Sviatoslav said that the places of confinement is a mirror of the society in which all illnesses and faults are seen. "Unfortunately very often our society rejects such people, doesn't give them another chance. But the Lord never rejects anyone of us. Our Lord always waits for every of His prodigal sons with open arms and is ready to be the first to meet him, embrace him and return to him the dignity of sonship", said the Head of the UGCC. "Our chaplains feel the presence of God next to the imprisoned. Many of them say that they have witnessed miracles of conversion, how, through the ministry of a chaplain, a person can really change his life thanks to the active visible power of God 's grace." He also emphasized the importance not only to help the imprisoned in jail but also help them return to the free world. "I mean the process of re-socializing for former prisoners. The Church as well as the state not only have to help those people quit criminal behavior, but also have to help them fully reintegrate, return to free life in the society," underlined the Head of the UGCC. His Beatitude Sviatoslav also pointed out that the ministry of a prison chaplain is necessary not only for the prisoners but also for those who are working in this system "so that those who are working with the imprisoned or are responsible for their safety and care, have the required human features so that they could remain people often in inhuman conditions".